Fresh fruit is preferable, but frozen berries or juice can be used is absolutely necessary.Make sure you discard and damaged fruit and that you wash your fruit well. Any fruit that can be used for canning can be used to making freezer jams. Determine the ratio of sugar and fruit – you will find this information either in a specific recipe or on the pectin package. Crush or finely chop fruit or berries and add lemon juice. Then combine freezer pectin with prepared fruit. Make sure that the pectin you are using is freezer specific and not the traditional canning pectin. The freezer pectin is usually in a liquid form but can also be found in powder form – so check the label carefully. Combine with sugar and any other flavouring – such as vanilla until sugar is completely dissolved. Freezer jam needs to be stored in a freezer-jam specific containers. Do not use store glass jars in the freezer. Plastic freezer jam containers are usually square or rectangular – but there are other shapes available as well. The important thing is that the containers you use have snapping (locking) lid. This will avoid freezer burn and allow you to store your containers in a nice, compact manner. Fill clean containers with prepared jam and let sit for about 30 minutes. Put the lids on, making sure they snap on tightly and place in your freezer. Once they are frozen, you can keep them virtually for as long as you want. When you are ready to use the jams, first thaw the container in your refrigerator overnight. 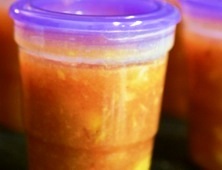 Fresh, ripe peaches make delicious freezer jam. It is important to choose peaches that are totally ripe – that will ensure your jam tastes great. Place peaches in a food processor and puree them. Add apple juice, lemon zest and lemon juice to a sauce pan and heat on medium-high heat. Slowly add the pectin, until it completely dissolves. Bring to boil, stirring frequently and boil hard for about 1 minute. Continue to stir the mixture until you add enough sugar to suit your taste and make sure all sugar is completely dissolved. Stir vigorously for 1 minute. Divide jam into your containers, leaving at least ½ inch space at top of each container to allow for expansion during freezing process. Cover container with lids and let sit at room temperature for 24 hours. Store in your freezer until ready to use. Wash fresh raspberries and crush to make 4 cups. Put into a large bowl for easy stirring. Start adding the sugar, little bit at a time, stirring after each addition. This is important so that you don’;t end up with sugar chunks in your jam. Pour the berry mixture into containers and freeze.